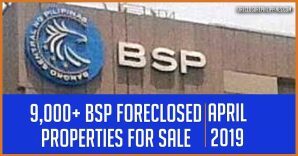 Since we decided to stop brokering foreclosed properties to focus on our own deals, we have not been able to get updated catalogs of Buena Mano/ BPI foreclosed properties … until now! Here’s their most updated catalog which they gave to us last week. Check it out below. 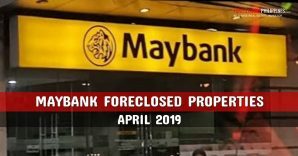 Note: The telephone numbers of the designated bank officer and their assistant that handles properties for a specified location can be found inside the catalog. 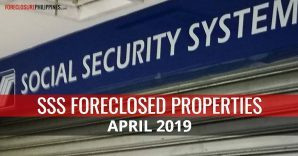 So if you are interested in a foreclosed property, please call them up directly. This is the fastest way for you to get information. If you are abroad, you may email Buena Mano at BUENAMANO@bpi.com.ph. Thank you for understanding! 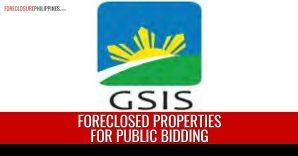 3 How to buy Buena Mano/ BPI foreclosed properties? 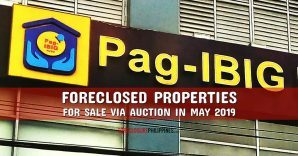 If you will notice, this catalog contains listings of foreclosed properties all over the Philippines. The list is actually quite big and has 72 pages in total. 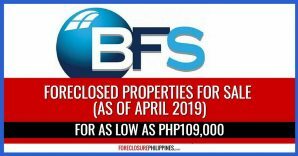 How to buy Buena Mano/ BPI foreclosed properties? Please refer to the FAQ below, which is actually in page 68 of the catalog. Frequently asked questions for Buena Mano foreclosed properties (click to enlarge). 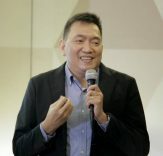 Source: We got a hardcopy of the catalog during a General Membership Meeting of the Real Estate Broker’s Association of the Philippines (REBAP) held last September 20, 2018, where Buena Mano was giving away copies of the catalog at their booth. To get details faster, please contact Buena Mano directly. 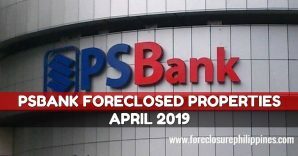 You may refer to the catalog for the telephone numbers of the designated bank officer/person-in-charge that handles the foreclosed property/location you are interested in. 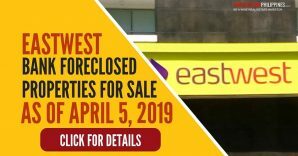 ALL PROPERTIES FOR SALE ARE ON “AS-IS, WHERE-IS” AND “FIRST COME, FIRST SERVED ” BASIS. Prices are not applicable to buyback transactions with former owners, call for buyback prices. 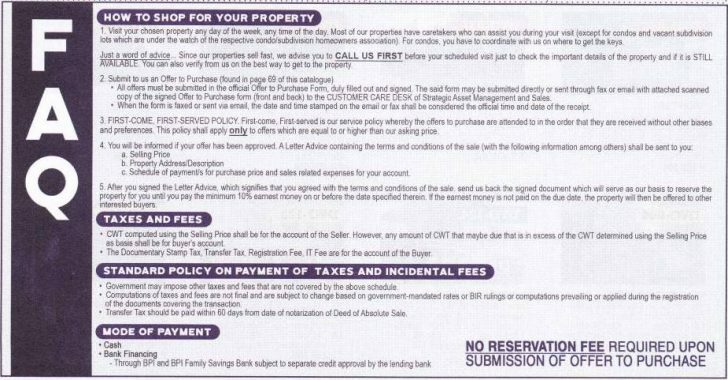 PRICES ARE SUBJECT TO CHANGE and MAY BE WITHDRAW WITHOUT PRIOR NOTICE. ALL OFFERS ARE SUBJECT TO MANAGEMENT APPROVAL. PLEASE CONFIRM ENTRIES BY CALLING OUR HOTLINE OR SENDING AN EMAIL TO BUENAMANO@bpi.com.ph. 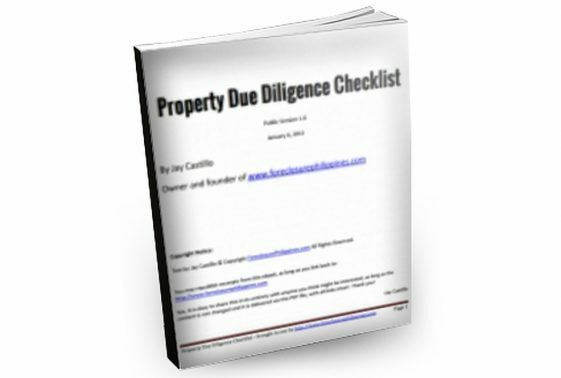 Misprints and other errors are unintended and do not consider acts of misrepresentation, intentional non-disclosure, fraud or withholding of accurateproperty details and pricing. P.S. 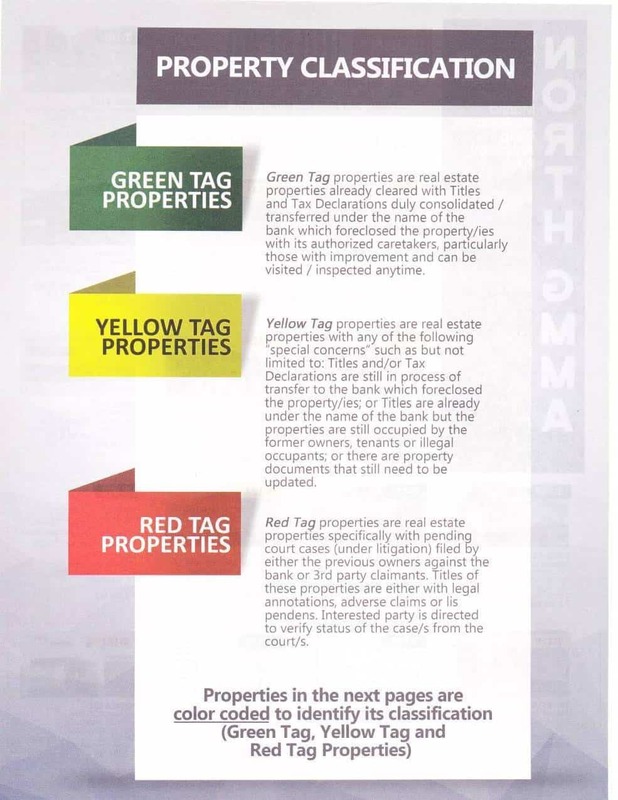 Yeah I know, it can be hard to search for foreclosed properties in a PDF catalog like this. Unfortunately, it would be very hard for me to upload this into our classifieds database because of how the listing is formatted. I can either get an encoder to type the contents into an excel sheet, or get a list from Buena Mano that is in tabular format. I tried asking years ago, but after several followups, it just did not materialize. I’ll try again when I am able to drop-by their office. Full disclosure: Nothing to disclose, we have stopped with brokering of foreclosed properties at the moment. 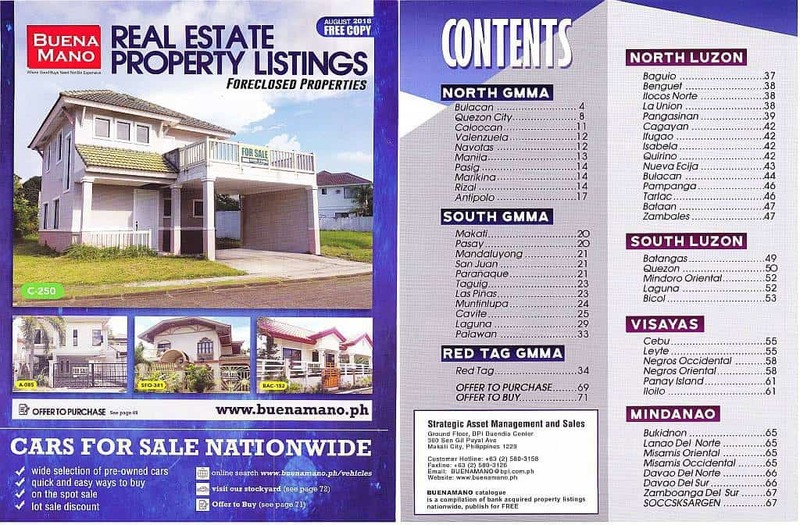 Please contact Buena Mano directly if you are interested in any of the foreclosed properties in the catalog(s).